We work with the finest builders and architects in Charlottesville, VA as well as with individual homeowners who may be building or remodeling. Nancy Brewer, owner, has 30 years experience in the lighting business. 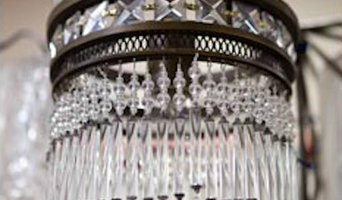 Nancy Bs House of Lights offers competitive pricing and carries the finest names in the home lighting industry including Progress, Kichler, Quoizel, Quorum, Murray Feiss, Minka Lavery, Hubbardton Forge, Elk, Hinkley, Hanover Lantern, Framburg and many others. Timberlake Lighting - Charlottesville is a locally-owned, family operated wholesale and retail lighting business serving the Charlottesville area and Central Virginia. We specialize in finding distinctive and sophisticated lighting solutions for every style and budget. Our experienced lighting consultants offer expert advice, superior customer service and a vast knowledge of the lighting industry. Timberlake Lighting - Charlottesville has the ability to assist with your project from start to finish, including design, selection and delivery. Renegade Art Glass is a fused and stained glass studio in the southern Shenandoah Valley area of Virginia. We specialize in unique lighting and architectural stained glass windows. Custom Lighting: You can get light fixtures from many sources. But only a few can create one just for you. At Renegade, custom light fixtures are among our favorite things to make. Beautiful lighting is complicated – you need art and technology to make a fixture that is appealing, functional and safe. Our combined five decades of art glass and engineering experience have allowed us to develop our own highly customizable lighting products. We offer an array of lighting products – small and large pendant lights, wall sconces and more. But we’ve designed the components so that the possibilities are only limited by our, and your, imaginations. Custom Stained Glass: The beauty of a stained glass piece, as with any art object, is a matter of personal taste. While you can hunt for and possibly find an off-the-shelf item that you like, why not have a piece designed to fit not only your personal tastes, but the exact space you have in mind? Karla has been designing and building in stained glass for well over 20 years. She has built windows and doors in every size from the smallest cabinet door insert to sets covering dozens of square feet. She’s created these in many different styles from historic Victorian and Arts & Crafts to Contemporary Abstract. From the beginning, Karla loved making pieces that had special meaning for others. She has turned this into a great skill – she is expert in drawing out your ideas and turning them into a design you’ll love. 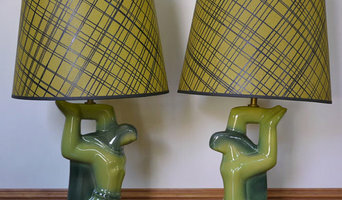 Fresh Vintage Mid Century Lighting, Lamps, Housewares and Art from the Shenandoah Valley in Virginia. WE ARE TIRED OF LIVING IN A BORING, LIFELESS CUBE....AND WE'RE NOT GONNA TAKE IT ANYMORE!!! JOIN THE REVOLT!! How many times have you walked through Office cubes and identified wire coat hangers that were bent over the side of the cube wall and used as a coat hanger? You spend more than 2000 hours a year in your office cube. Why not make it a little more pleasant? After all....YOU DESERVE IT. As office cubicle "rats" in a maze of lifeless cubes, we have strived for years to find ways in which we could improve our work "home away from home". When we use to look for office cubicle accessories, we could only locate one or two items per company site at a time. At CUBE STUFF, we locate products from all over the world to provide you with a wide selection of useful products to make life easier in your cubicle. When you select and order products from our site, we will fulfill those items ordered either from our location or directly from the manufacturer or their distributor. We are a Service Disabled Veteran Owned Small Business that is located in Culpeper, Virginia, just outside of Washington, DC. We are not looking to take over the business world, just to make better workplaces for you to manage better. We are here for you. Please note: Currently CUBE STUFF does NOT ship to Hawaii, Alaska, U.S. territories, some PO Boxes, APO or FPO addresses or international. We will let you know when this will change. We are sorry for any inconvenience this may have caused. We provide exemplary lighting design and lighting industry consultation to exceptional clients in North America and the Caribbean. We are expert in hospitality, high-end residential, landscape and some commercial markets. We are proud to work with the best design teams in North America. We provide integrated design of lighting, building management, and audio-visual controls. Founded January 1990. My passion is to help residential and light commercial consumers with their lighting solutions and selections with mindful consideration of personal styles and budgetary concerns. Think about how you plan to use each area of your Grottoes, VA home. It's important to communicate to your Virginia lighting designer which space will be used as an office and which will be a media room, for example, as these will require very different lighting methods. In addition, consider how you'd prefer to control the lights. Lighting technology today includes dimmers, sensors, photocells (that let lights react to the amount of daylight in a space), programmable scene controls (that let you program different settings for varied lighting) and whole-house lighting controls (that let you control all or a portion of your home's lights from one source), allowing you to tailor your lighting controls however you wish. Find a lighting designer on Houzz. Narrow your search in the Professionals section of the website to Grottoes, VA lighting designer. You can also look through Grottoes, VA photos by style to find a lighting design you like, then contact the designer.